Folger Education’s work with the local public school system in Washington, DC, provides an ideal testing ground for scaling on a system-wide basis the proven methods for teaching Shakespeare with which the Folger has been equipping educators nationwide for decades. Building toward these successes in DC classrooms inspires the Folger’s work with teachers everywhere. When Alexa Bernard introduces her ninth-grade students to Romeo and Juliet, they don't start with famous speeches and characters, or with the prologue. They begin instead with quick-moving exercises using words, phrases, and Shakespearean insults. "I love the beginning, because it hooks them," says Bernard, who teaches at Bell Multicultural High School, part of the Columbia Heights Educational Campus or CHEC—which in turn is part of the District of Columbia Public Schools (DCPS). Teacher Alexa Bernard (right) with her students at the 2018 Cornerstones Festival at the Folger. Photo by Teresa Wood. Her students come to the play, she says, thinking "Romeo and Juliet, people in tights, and I don't know what they're saying." But with the focus on the words, the students are soon out of their seats and relishing the experience. Compared to other topics, "it's more hands on, more interactive—that's what we love about Shakespeare," Bernard says. "There's a huge difference, and students enjoy it." When she teaches Romeo and Juliet, Bernard uses the DCPS-Folger curriculum for the play, which debuted in the 2015–16 school year. The Romeo and Juliet unit, which lasts several weeks, goes from words, to lines, to speeches, to scenes and characters, and more. "You build and build," says Folger Director of Education Peggy O'Brien about its approach. “Once you are getting kids up on their feet, with the language in their mouths, they own these plays." What's remarkable about the DCPS-Folger Romeo and Juliet curriculum—and the DCPS-Folger Hamlet curriculum for tenth grade—is that it is used throughout DCPS, in nearly every ninth or tenth grade classroom, in every high school. It truly takes Folger teaching methods citywide. O'Brien, who led Folger Education in its early days in the 1980s and early 1990s, returned in 2013. While pursuing Folger Education's many local and national programs, she has also focused on supporting DCPS, which she describes as the Folger's "home team." Just before she came back to the Folger, she was part of the DCPS leadership team, where she gained a key insight: it's often best to ask a school system what it needs. As Folger Education director, she learned that what DCPS needed most was simple but major: a new curriculum for its high-school Shakespeare units, starting with Romeo and Juliet in ninth grade. 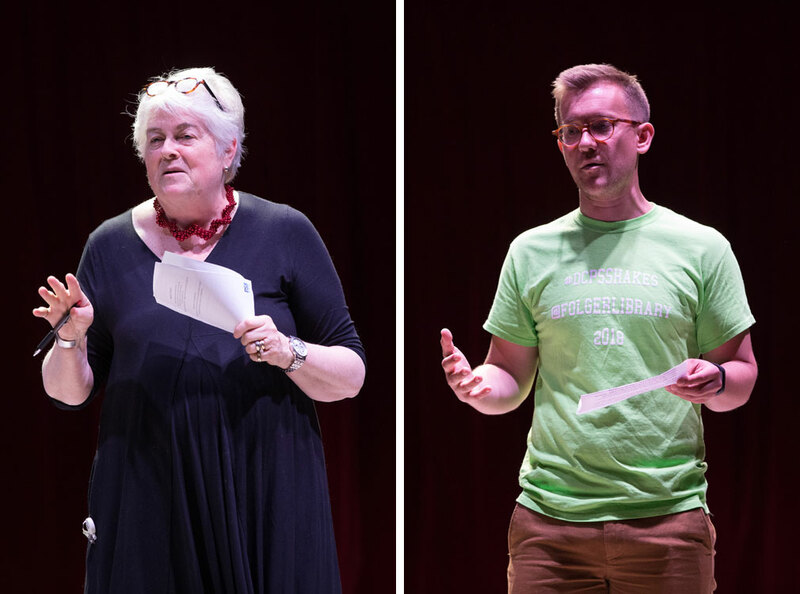 (left) Peggy O'Brien, director of Folger Education, and (right) Rob Yates, DCPS manager of Secondary ELA (English Language Arts) Curriculum and Professional Development. Photos by Teresa Wood. To make that happen, Folger Education worked with Monica Green, a DCPS middle-school teacher who had attended the Folger’s Teaching Shakespeare Institute in the summer of 2014. 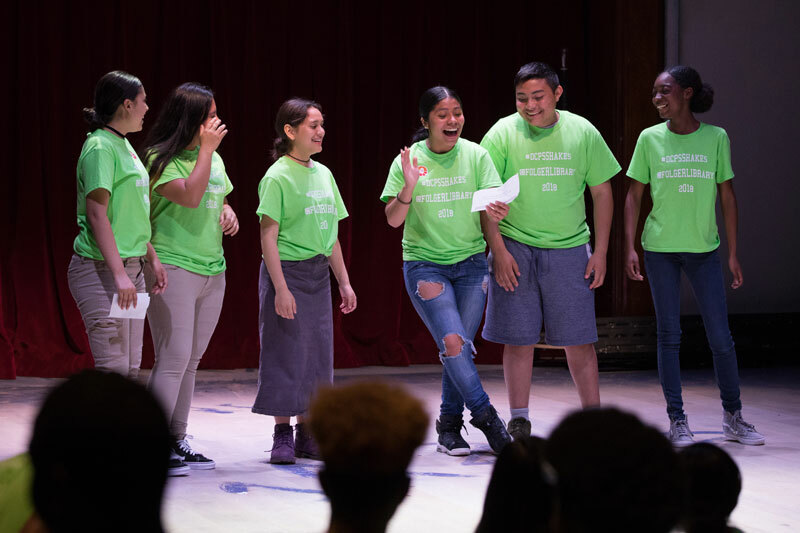 In partnership with the Folger, Green spent the next summer forging links between Folger methods and DCPS requirements to create the Romeo and Juliet unit. "She was instrumental in taking the Folger method and adapting it to DCPS structures and systems," says Corinne Viglietta, assistant director of Folger Education. After the first year in which schools used the unit, Viglietta and the Folger reviewed and revised it, working with DCPS staff—a process that was also followed for the tenth-grade Hamlet unit, which Viglietta crafted. Both units are still regularly adapted and revised. Another key part of the program is professional development for teachers. These continuing workshops, which are often taught by O'Brien or Viglietta, receive rave reviews. "This was, hands down, the best professional development that I experienced that year," says Alexa Bernard. "We got out of our chairs and we performed it" and then "learned new techniques to draw students in, the way we were drawn in." Both the Romeo and Juliet and Hamlet units end with a multiday segment that DCPS calls a "Cornerstone." DCPS Cornerstones, which exist for many subjects and grades, are intense, culminating events that occur in every DCPS school, helping to ensure equity. Rob Yates, who works closely with the Folger in developing and implementing the DCPS-Folger curriculum, is the DCPS manager of Secondary ELA (English Language Arts) Curriculum and Professional Development. He also worked on the Cornerstones initiative. To understand the Cornerstone idea, he says, think of a positive, "formative moment" in your education that you will always remember. That's what the Cornerstones seek to replicate, he says. "It's high-level education." In the Shakespeare units, a class is divided into four or five small groups to do the Cornerstone. For several days, each group works on a short scene from the play. Among other tasks, the group must thoughtfully cut its scene in half; make decisions on how to stage it; write an explanation of these decisions; record all of its choices in a promptbook; and perform the scene. 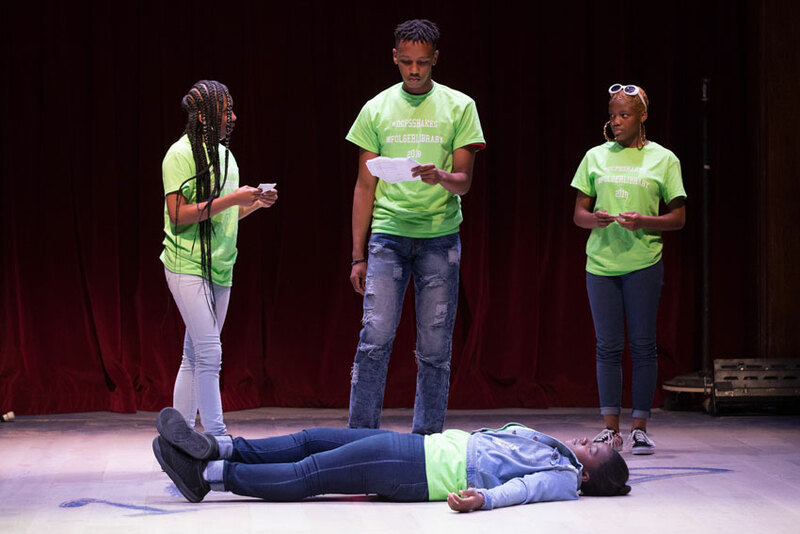 DCPS students perform a Shakespeare scene at the 2018 Cornerstones Festival at the Folger. Photo by Teresa Wood. 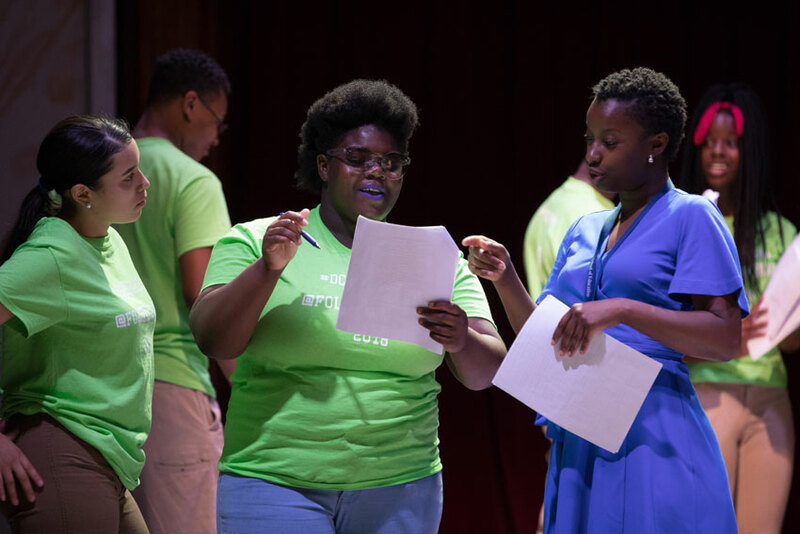 For the past two years, some ninth and tenth grade DCPS classes have also performed the scenes in a Cornerstones Festival held in June at the Folger. Unlike the Folger's mid-year student festivals (which also include DCPS students and teachers), the Cornerstones Festival "starts from a different place," says O'Brien. "It is meant to demonstrate the kids' learning and it is for parents, other kids, and teachers." The festival is held in the late afternoon and evening, so that more parents can attend, and is made possible with help from the DC Public Education Fund. And, says Corinne Viglietta, "It's totally exciting." "The students are incredibly engaged," says Rob Yates. "The teachers step back and the students emerge in an authoritative way: 'This is the work we have done, here's the evidence of it.'" Each student group stays on stage after it performs, so the members can field questions from students in other groups, who are in the audience. Those students can "see and interpret what's going on," he says, "and they are eager to provide feedback." One year, "a group of tenth graders did the final scene of Hamlet," says Viglietta. "The ninth graders in the audience collectively gasped." They did not know what happens in Hamlet, since it's studied in tenth grade. "They turned to each other, 'This play is lit, I can't wait to do this play next year.' It was so exciting that tenth graders could tell the story in a clear way. Many of them are multilingual and new to this country, but Shakespeare's language is not a barrier to them," Viglietta says. "They tackle it and share it." When Alexa Bernard's students performed at the Cornerstones Festival, their work shone through as well. "This performance brought it to everybody's eyes, to everybody's attention," she says, including "the students themselves. Parents came, and some might not have come the entire year. They thanked us for getting them there." The Cornerstones Festival "definitely gave me that feeling that all teachers want to have," says Bernard. "This is worth it. This is why we do what we do." Esther Ferington is an editor, writer, and content developer based in Alexandria, Virginia. UNESCO has given 90 documents (six of them at the Folger) the same cultural status as the Magna Carta and the Gutenberg Bible. This initiative led to the publication of a new collection of lesson plans for teachers. Folger Director Michael Witmore writes about appreciation for and stewardship of the Folger Shakespeare Library's historic building.